Waves for All in Vila do Conde. 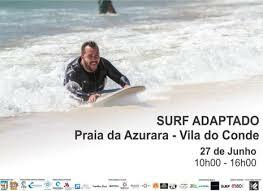 On the 27th June the AdaptedSurf Portuguese Association will held another session on the Azurara beach, which will make this sport accessible to people with disabilities. This event is free participation for all who want to take part of it. Open to people with any kind of disability. It will be offered a lunch snack at all. Founded on May 16th 2012, the SURFaddict – Adapted Surf Portuguese Association resulted from the project “Estado Liquido” and is the first adapted surfing association in Europe. Among its founders is Nuno Vitorino, a former Paralympic swimmer. Its main objective is to transform the Surf a sport for all. The SURFaddict want to create a movement that allows people with disabilities to enjoy the sea, based on a simple principle: to train the surf schools and create between the surfing community, a great movement of volunteers. This association has the ambition to defend the rights of practitioners with reduced mobility access to beaches and waves sports, in areas ranging from competition to environmental protection and national surf promotion to those practitioners. ‹ PreviousOndas Para todos em Vila do Conde . Next ›"Beauty and the Beast" with inclusive session in O’Porto.